Okay... I have a dilemma. My slow cooker died a few months ago (at age 15) and as autumn nestles in and the temperatures cool, MommyO is realizing that she needs a new one. I have loved my slow cooker like a BFF (even devoting a whole Pinterest page to this small appliance), but new small appliances have been invented that have also become life changers, and I'm now thinking long and hard about the Instant Pot. All my friends are in love with their Instant Pots a lot, so maybe I should just step up to the plate and get ready to hit dinner out of the park too?? and made the switch to the Instant Pot?? 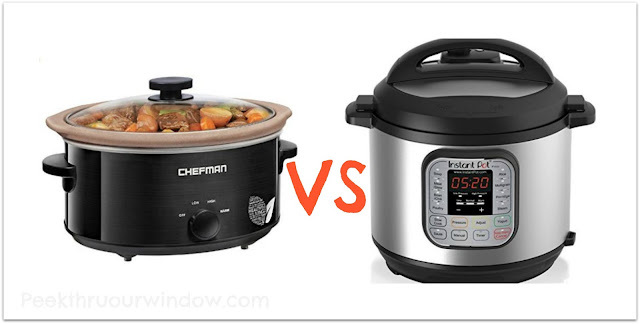 I want to know why you like the Instant Pot more than the slow cooker you once loved, but I also want to hear if everything will be A-ok if I just soldier on and buy a good ol' slow cooker? I'm mostly keen to prepare meals while I am at work; however, I am also intrigued by the fact that the Instant Pot speeds cooking times up (meaning I could still use it when I return home from work), and that it also replaces up to 7 other small appliances. Me and my cupboard space smile at that prospect.